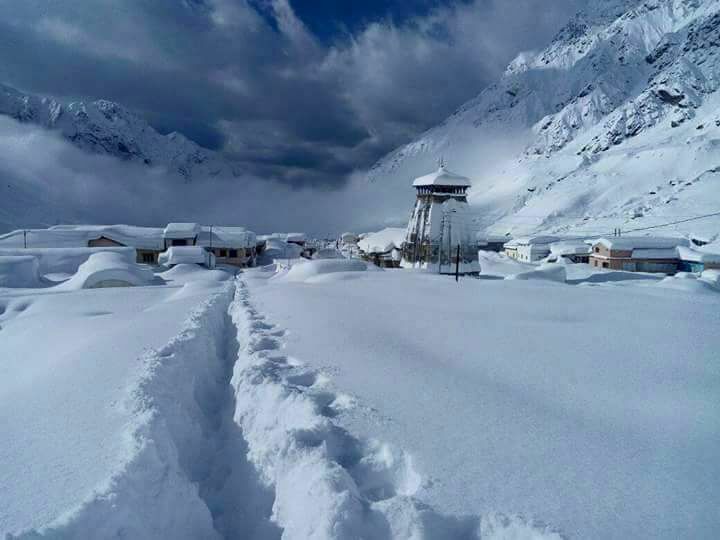 Kedarnath is known as the Dwaram or Entrance of Kailasam. "ke" refers to Kailasam and "dar" refers to Dwaram to Kailasam. It is said that Adhi Shankara received 5 Spatika Chandramouliswara Lingam from Lord Shiva in Kailasam and brought it to Earth through Kedarnath. He installed them in different Shankara Matams across the country. Adhi Shankaracharya reinstated the worship of Kedarnath by nominating a Karanataka Veera Shaiva Brahmachari as the Main Priest here. Till date the tradition is followed. 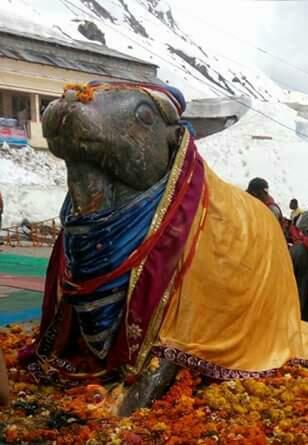 Lord Shiva gave Darshan to Pandavas as the back portion of the Bull in Kedarnath here as seen below. 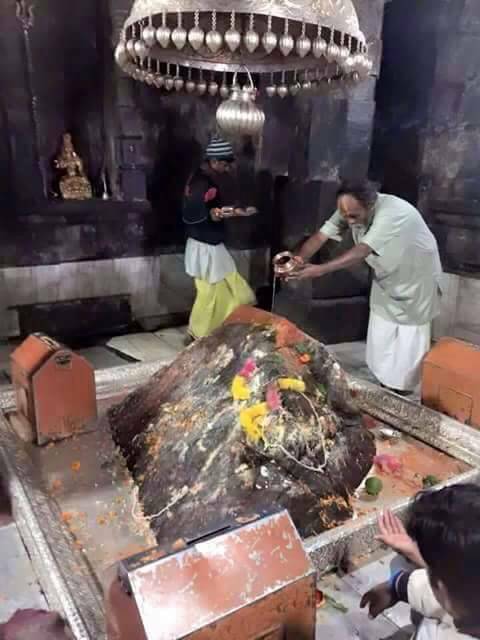 Kedarnath Jyothirlingam below is one of the 12 important Jyothir lingam temples in the country. 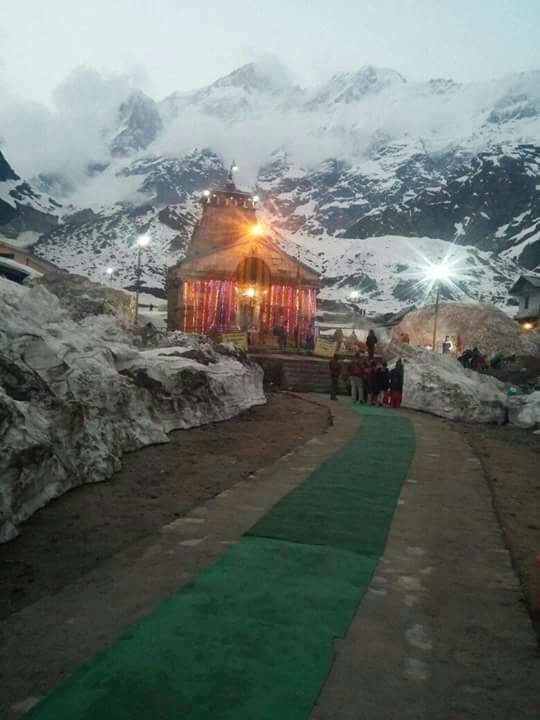 The Nandhiswara guards the Kedarnath Temple as seen below. 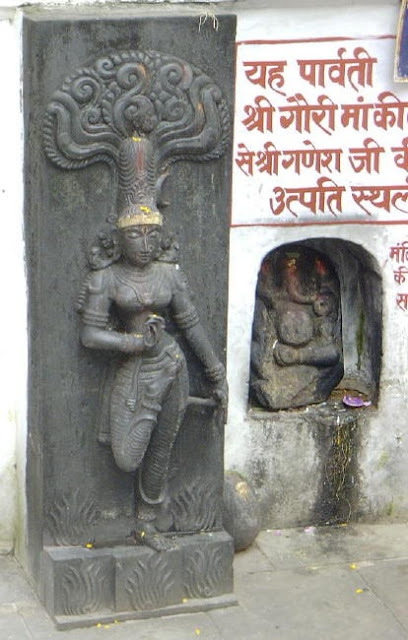 Kala Bhairava is also said to be in invisible form guarding the Kedarnath Temple. It is important to note that how many ever floods affect kedarnath, this Temple, Nandhi and Jyothir Lingam of Kedarnath remain unaffected. There is a sthala puranam behind this Jyothir lingam as detailed below. Pancha Pandavas wanted to worship Lord Shiva after Kurukshetra Yuddha in order to atone their sins. 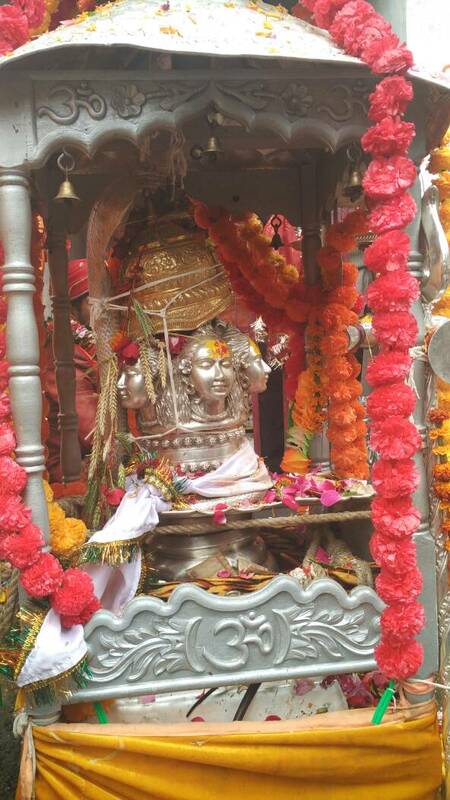 When they reached Kasi to worship Shiva, Lord Shiva disappeared into a place called Gupta Kasi in Uttarkhand. There Pandavas got Darshan of Lord Shiva as Arthanareeswara or Half form of Shiva and Shakthi together. From there the Pandavas went in search of Lord Shiva again. In Kedarnath, Lord Shiva gave darshan as a bull to Pandavas. The Bull started sinking into the ground on seeing the pandavas. Bhimsena got hold of the back portion of the bull in order to prevent it from sinking into the ground. Lord Shiva gave a asareera vakku or celestial sound that the Pandavas will not be able to see the full form of Lord Shiva. Lord Shiva's hump as a bull would be visible in Kedarnath, arms/feet will be visible in Tunganath, Middle portion of navel and stomach will be visible in Madhya Maheswar, Face will be visible in Rudranath and his hair and head or Jata mudi will be visible in Kalpeshwar. These temples are collectively known as Pancha Kedarnath Kshetram located around Kedarnath. Pasupathinath in Nepal has the lingam representing all 5 faces of Lord Shiva. 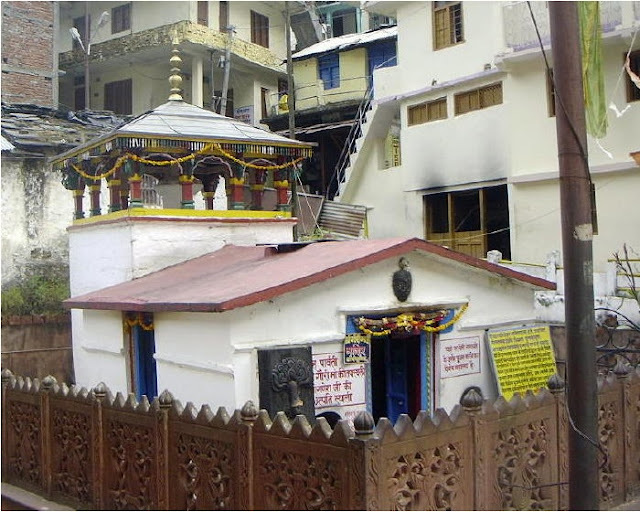 Another puranam of Kedarnath states that Lord Vishnu has worshipped Shiva before Pandavas for so many years here that his Dwara Palakas, Jaya and Vijaya stayed here itself. Hence in Kedarnath Temple the Vishnu Murty Dwara Palakas Jaya and Vijaya are seen instead of Kailasa Dwara Palakas. 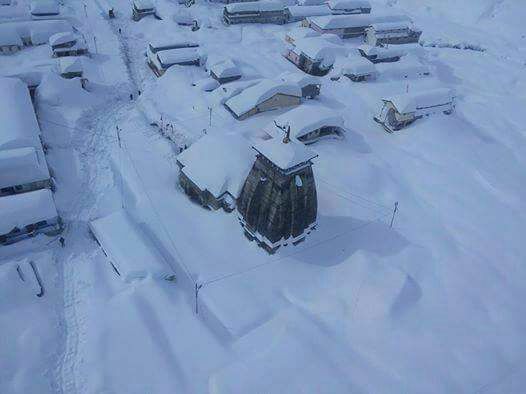 During this Snow covered period, the Utsava Murty of Lord Shiva with the five faces of Lord Shiva is worshipped in Ukhi Matam. This Five faces of Shiva is carried in procession back to the Temple as seen below after winter period. 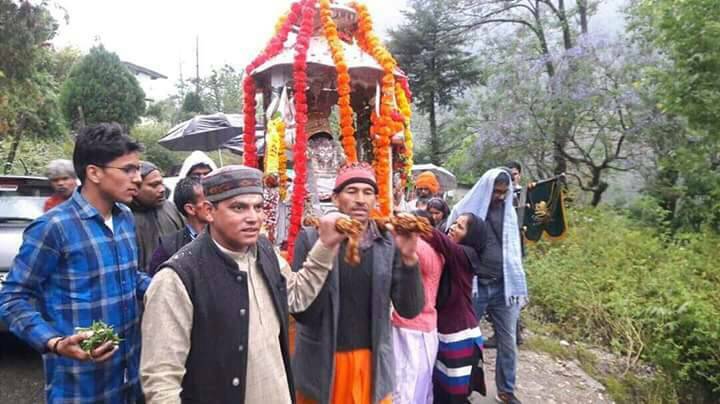 Kedara Gauri Devi has performed penance for 21 Chathuryugas near kedarnath temple in order to marry Lord Shiva. There is a place called Gauri kund near Kedarnath where she created a pond and worshipped Lord Shiva. Kedara Gowri Vratham is generally followed during Deepavali Amavasai period where Kedara Gauri devi is worshipped with kalasam. In the pooja all naivedyam like adhirasam sweet is 21 in number, tamboolam leaves, betel nuts or turmeric is also kept 21 in number in memory of Kedara Gauri devi's 21 Chaturyugam penance to marry Lord Shiva. Gauri devi herself observed the Kedara Gauri Vratham. If falls on 19th October 2017 Thursday this year. Kedara Gauri devi peforming penance in one feet is seen in photo below. Gaurikund is also the place where Gauri devi reinstated Ganesha as the Guardian to prevent anybody from disturbing her while she takes bath. But Ganesha stopped Lord Shiva also in the process from seeing Gauri devi. Hence Lord Shiva chopped off the head of Ganesha with his Trishul. Gauri devi became very depressed and angry on knowing this issue. The place where Ganesha's head was chopped off is also found among the mountains nearby. Lord Shiva later installed the head of an elephant to Ganesha to give him life. He was blessed to be Gajamukha and the primodal deity to be worshipped in any pooja. 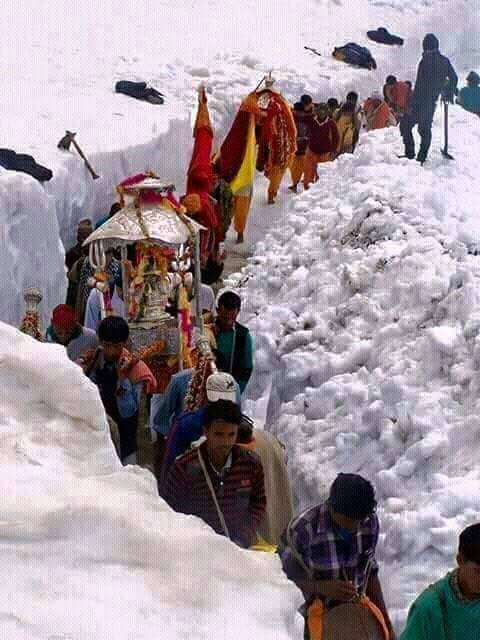 One can travel in vehicle to Kedarnath till Gaurikund. After this place for a distance of 14 Km one can travel by foot or by Helicopter to reach Kedarnath temple among Mountains. There is a Hot water spring here where devotees can take bath.